The soldiers brought the victim to a holding cell, his hands bound with rope and his feet shackled with chains. The room was barren, save for a couple of bamboo cots. The room reeked of things you would expect from places like these: sweat, urine, and animal dung that wafted from the boarded-up windows. In the room flickered the light of a solitary gas lantern, casting a pallid yellow glow on the cracked concrete floor. 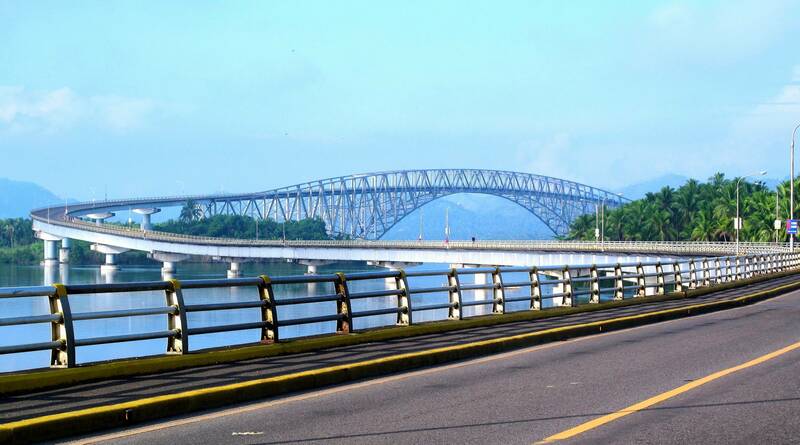 “San Juanico,” the commanding officer said curtly, as if referring to the bridge miles—or perhaps a short walk, who knows—miles away. The crickets chirped a little louder. A lone rooster crowed in the distance. The prisoner’s eyes, swollen from lack of sleep and bruised from the unforgiving blows of truncheons, lit up in fear; the whites of his eyeballs piercing the darkness briefly. “San Juanico” was nothing more than a euphemism for the torture invented by the Marcos regime at the height of Martial Law. Countless activists have been made to suffer the sentence, named after the great bridge that connected two of the country’s poorest islands. The bridge was a marvel that would be shared in postcards for generations to come; the torture was a memory best left forgotten by those who miraculously survived it. The Marcos administration was built around edifices; structures and monuments that glorified the New Society, but hid many of the problems that caused unrest and dissent. While many have praised Marcos’s vision to literally build bridges, the structures themselves were not without a sense of irony. Today, the San Juanico Bridge is a showpiece of elementary school civics and history classes: the longest bridge in the Philippines. Jeeps, buses, and cars pass between Tacloban and Santa Rita along a two-lane section of the Pan-Philippine Highway. It was Ferdinand’s Taj Mahal for his wife, Imelda: the enduring symbol of his love. Yet whatever promise for development and progress in that area drowned in the thousand whirlpools of the strait: 45.4% of the population of the Samar-Leyte region live in poverty. San Juanico is an edifice, but never really lived up to what it was supposed to do. To survive “San Juanico,” one requires an uncanny and inhuman sense of balance. Two cots, “Samar” and “Leyte,” were placed as far apart as possible, and the victim’s body was used as a “bridge” between the two. Like any bridge, the body must remain rigid and steady between the two cots. The moment the body sags or bends, the victim was beaten savagely. While not the most gruesome of tortures, “San Juanico” was the most grueling. While suspended between the cots, the prisoner was interrogated, persuaded, and often beaten. The prisoner was on his third hour on the “bridge.” His neck muscles were strained from trying to prop himself up, his calves tensed up from hours of the torture. He’s sagged five times over the day; each time, the goons beat him up with everything from their boots to scraps of wood. His face was beaten up enough to make breathing and talking difficult: if he ever made a confession as to the whereabouts of his comrades, the unintelligible words came out from the corner of his bruised and bloodied mouth. The victim, laid out there stretched and helpless between two cots, gave the goons all the room in the world to play their games. Maybe it was to elicit a confession, or that some complex in their heads was triggered by the chance for torture. The prisoner between them was no longer a human being, but a disposable body. The body was kicked in the ribs. Cigarettes were extinguished on the skin, and molten candle wax was dripped onto sensitive areas. The goal was to make this body sag, so that it can be beaten again. To the powerful, dissent is something best left quashed. Torture exists not only to inculcate fear, but to demonstrate power. Those who wield power with impunity will find a thousand ways to kill, but won’t have a thousand ways to make other people’s lives better. The boarded-up windows of the holding cell/torture chamber let in the light of the early morning sun. Outside, the sounds of farm life give some sense of normalcy—perhaps even quaintness—to the outside. Cows mooing, chickens clucking, the sound of machetes chopping cane. Inside the cell, though, the names of comrades were finally given. The laughter of soldiers pierced the stuffy air. The prisoner, near-death, was dragged back to the cells, rope and chains and all. The bridge that bears the name of his torture still stands today. The scion of the man who made that bridge his is running today. And the lone rooster still crows from the coops of that place: its echoes bearing traces of the screams kept hidden in that holding cell.